Who else is excited that hair scarves are in style?! I believe that hair scarves or bandanas are such a simple yet chic way to make your outfit cuter. Today I am showing you how I styled this floral one from Old Navy! Old Navy has quite a few different prints that are adorable, so I definitely recommend checking there if you need to add another scarf to your collection! I also made this little graphic to show exactly how I put my scarf in. 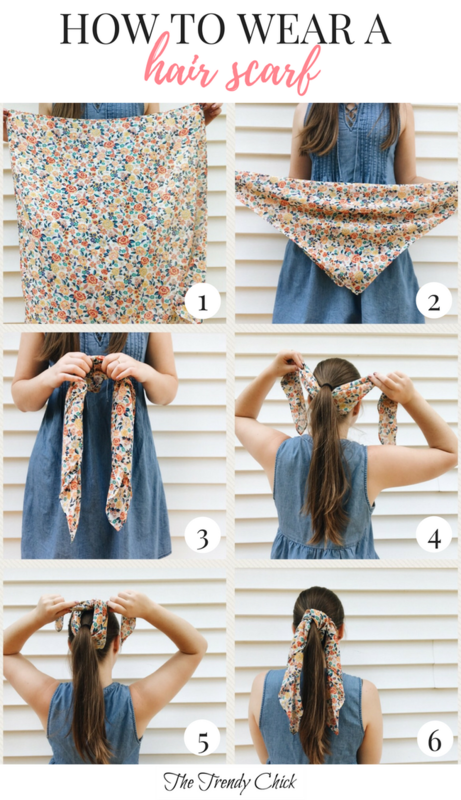 To get from step 2 to step 3, just spin your wrists in circles to make the scarf wrap around itself. Then just start under your ponytail and tie once on top! You also can roll up the scarf before you tie it, but I like the looser look without it being perfectly rolled up. Do you love the hair scarf trend? What is your favorite way to wear it? Let me know in the comments!